. 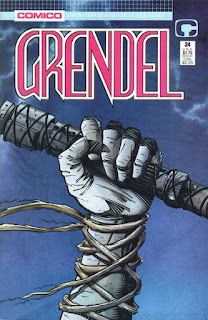 . . because Grendel by Matt Wagner is how I discovered that there were comic books made by folks other than Marvel and DC – and that they were incredible! To paraphrase the title’s creator, Grendel is a study of the nature of aggression. It begins with a single man, Hunter Rose, chronicling his rise to reign over a criminal empire in Devil by the Deed, then goes on to tell the tales of others whose lives were impacted by the force that is Grendel, taking readers through an epic journey ultimately concluding in the 26th century and a world where the nature of aggression has become the nature of man. 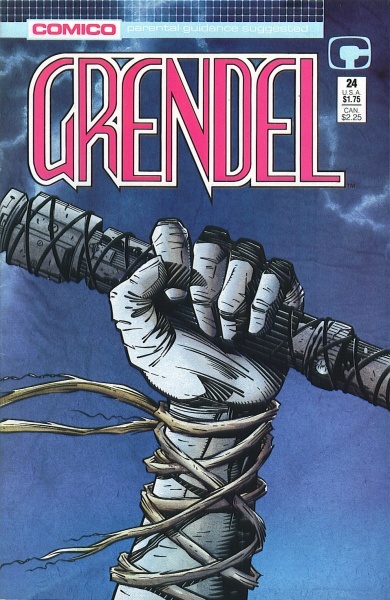 But to me, a kid with aspirations of creating comic books in the late 1980’s, Grendel was so much more. Wagner’s vision of where a comic could take the reader, and the way he built upon a singular premise, impacted me in a very visceral way. The scope of the story was something I had never seen before, at least not in “Big Two” comic books, stuck in perpetual second act story telling. I was reading graphic literature, each arc having a beginning, middle and end, feeding into the larger narrative. 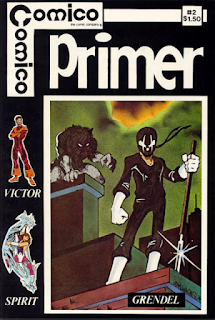 Originally, in Comico Primer #2, (and what a happy day it was when I finally found a copy at a comic shop in who-knows-where), the initial three issue Grendel series and then when he published the art deco gorgeousness of Devil by the Deed as a back-up in Mage, Wagner handled the art for his creation. 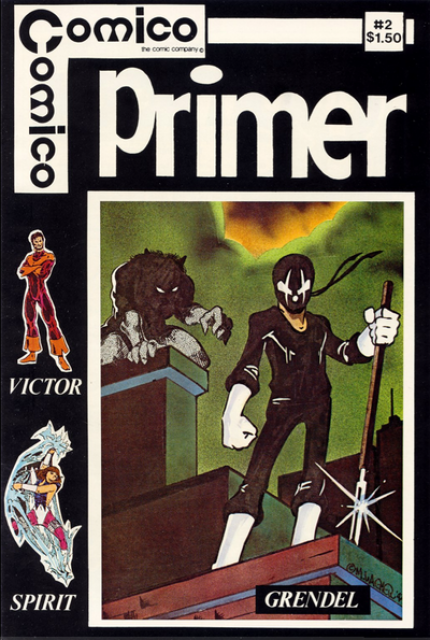 When the Grendel regular series debuted from Comico, he was focusing on writing and the art was handled by the Pander Brothers. 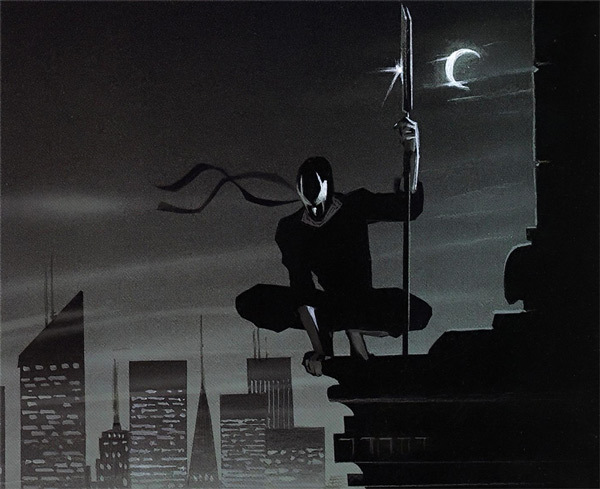 The Pander Brothers would be the first of an all-star line-up of artists, including Bernie Mireault, Tim Sale, John K. Snyder III, Jay Geldhof and Wagner himself. I remember being initially disappointed that Wagner wasn’t drawing the regular series, but that disappointment turned to wonder as I saw how the different art teams brought a personality unique to the story and how Wagner wrote to the artistic strength of each collaborator. 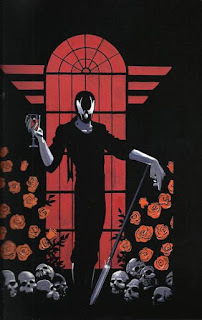 As opposed to a “Grendel house style”, each arc was, and still is, alive with the vision of the artist intertwining with the goal of Wagner’s story, a marriage of words and pictures that epitomizes what true collaboration can create. So “Why Grendel?” Because if Frank Miller’s Batman: The Dark Knight Returns is the reason I love to write comics, Matt Wagner’s Grendel is the reason I love to write independent comics. 1.1: One-third panel of a dense forest with over-grown paths and everything else is bush, trees, and overwhelming. It is strait up, dense, forest. 1.2: TITLE PANEL: Black with location caption and titles, credits, etc. PRESENTED IN GLORIOUS NINE PANEL GRID. 1.3: Back to the 1/3 panel and the woods. A BOW HUNTER  steps out of the heavily wooded area. He’s dressed head-to-toe in camouflage. It looks like he just materialized from a trunk of a tree. 1.4: Close on the edge of the HUNTER’S CROSSBOW: the arrow releasing from it. The arrow has red tips on its feathers. CAP: …was when I shot my first buck. 1.6: The arrows end up in the neck of a BUCK. 1.7: Booted feet stand on either side of the BUCK. It’s still alive—struggling for air. BOW 1 [O.P, ON THE LEFT]: Who get it? BOW 2 [O.P, OPPOSITE]: I did. 1.8: They’re looking up at each other. BOW 1 has scruff on his face—a boy trying to be a man--and a lot of pock marks on his face, covered in camouflage. BOW 2 wears neon orange and a Carhart camo hat that displays the GRENDEL logo on it. BOW 1: It’s still alive. BOW 2: --Put it out of its misery. 1.9: BOW 1 has a stone over his head, a trail of BLOOD follows in an upward arc. BOW 2 [O.P. ]: Yeah, bud! I will readily admit to being rather unfamiliar with Grendel myself, but I do like the overall thrust of this page. I dig the idea of the Grendel-esque figure encouraging some more visceral violence - strikes me as pretty effective. I would personally leave that final panel without dialogue though, as I think the moment speaks for itself. Also, I recognize that posting into the comments isn't always the perfect process, but do note you have a couple of typos in your dialogue (between panels 3 and 4 and panel 7) that distract from the reading a bit. Thanks for your thoughts, but yeah those are not typos. They're intentional. I suppose I could have capped them to show that, but considering how people--especially the kinds of characters these folks are--talk around here, having poor grammar and even worse speaking skills is the norm.